It’s one of those “Choose Your Own Adventure”-type books, but with that Super-fella I’m sure some of you have heard about. I ended up buying it, primarily for three reasons: first, I am a Superman fan, and this kind of oddball thing is right up my alley. Second, pal Andrew has his Choose-Your-Own-Adventure Tumblr You Chose Wrong, and I figured I could contribute some endings from this book for his site. Third, I could write about it on my own site. And thus, here we are. I’ve only done one read-through, following a couple of different branches here and there when it was pretty obvious when a decision was going to lead to an unfortunate ending. In the narrative line I followed, Superman ends up going with Lex Luthor to fight it out on another planet with a red sun, nullifying Superman’s powers so that they can engage as physical equals. If he didn’t do so, the missiles Luthor has aimed at Metropolis would activate, destroying the city. At various points you are given options to knock out Luthor (which sets off the missiles, automatically activating when Luthor is disabled), or even to straight up let Luthor get killed (very unSupermanly, resulting in an appropriately bad ending for Supes). 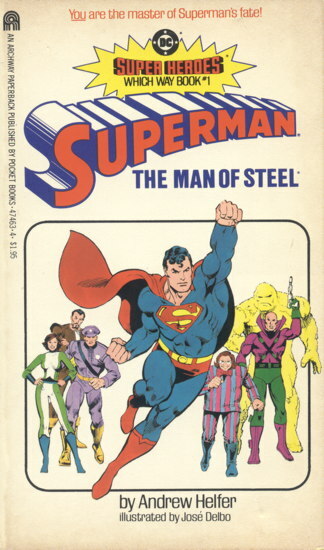 As you can see on that cover, there are other villains that turn up along the way, such as the Toyman and the Phantom Zone villains (General Zod and Faora, of course, but also the fabulously-named Kru-El). The book helpfully includes a couple of pages of villain fact-files, which you are invited to turn to when the villain(s) first pop up in whatever narrative thread you’re following. Hold on, only reading one line of narrative before writing this post doesn’t seem right. Let me go through again and see what happens. Be right back. “‘Help me!” Superman shouts to the creature. I’m a lousy Superman, it seems. Also, you can see the Bravado Beast itself in this article about Superman’s zoo. One more point about this book…on the very first story page, Superman is referred to as “Earth’s Mightiest Mortal,” which I’m pretty sure was solely Captain Marvel’s tagline. That Superman, always horning in on Billy Batson’s action. I remember this book, it was my introduction to the format. I remember finding the different ways Superman (or I) could get killed disturbing but fascinating, and kind of liberating since the pop culture for most kids in the 80s was fairly death-free. I remember the name Kru-El coming up in interviews with the Superman The Movie writers, when they did their comics research. It was a name they were determined NOT to use. I don’t have the issue of Justice League in front of my, but Ultraman’s dad’s name in the current New 52 version of the Crime Syndicate was Jor-Ill (can’t remember if it was on “L” or two in “Ill”), which I thought was awesome (and sorta made me roll my eyes when I read Johns saying in an interview that the Syndicate aren’t the evil duplicates of the JLA, but something more subtle than that). Thanks for all the good stuff you publish Mike! Neat! I used to have one! Fixed the links. Sorry everyone. You just made me go look through my collection of childhood books, because I know I had this. And sure enough, there it was between an Indiana Jones “Choose Your Own Adventure” knock-off, and a Justice League “Which Way Book”, with all the big names (and Firestorm) running from a giant head of Darkseid. Also found: 2 non-DC “Which Way Books” and two 1960s novelisations of “Get Smart”. I know how I’m spending my snowed-in winter now! Always been a big fan of the “choose your adventure” style books. Sure, some are worthless drivel, but others really strive for a cohesive narrative that makes sense for the character in question. I had the full set of Marvel ones from TSR in the late 1980’s (sold them all except for the few that had Doctor Strange in them) and those weren’t bad. In fact, the DOCTOR STRANGE one is an actual favorite entry of the character for me. Yep, definitely had this when I was a kid. The description of Faora definitely brought back memories. If I recall correctly, a big part of getting a good ending was choosing the right weapon out of the Fortress of Solitude for whatever villain and situation Superman was about to face. You Chose Wrong accepts reader submissions, so if you’d like to spread the bad ending joy of any of those books….